there was a need to scratch them itchy hands. 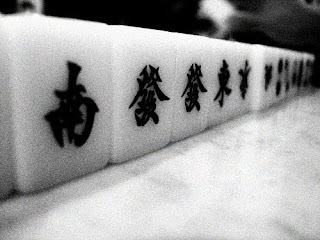 lucky for me, it was not only me suffering the itchy hands syndrome, so with a phone call, a table of four was set up to have a round of mahjong. my grandauntie once told me that my luck was not too bad, it had something to do with those zodiac signs sort of thing. as for me, ain’t really a fervent believer of horoscopes and all since not really all that superstitious, nonetheless, there are some things that one cannot help but have to believe. in any case, when me just started learning the game, was lucky that there was quite a streak with what is infamously known as “beginner’s luck”, although seriously, there is only that much “beginner’s luck” one can have. after all, how long can one be a beginner for? seriously speaking, really honestly been quite the jinxed one. guess that is karma for cursing a little too much for my own good. okay, that is of my own evil doing, a little too late to change that, so the least that can be done at this point would be to keep at not cursing anyone else so as not to prolong my miserable torture of jinxdom. the result for the night was to be expected, taking into account my lack of skill and technique with the game. in all honesty, was just lucky to not lose my underpants along with the night’s losses. for one, kept feeding the following player all the tiles she wanted throughout the night. it was not something totally deliberate. it was, and still honestly think is, the tiles. whenever they were opened, a good more than half would be that set up for a hand of thirteen odds. this happened consecutively for at least five if not more, easily, rounds. evil? lucky? you tell me. very sadly, it is statistically close to impossible to get that elusive hand of thirteen odds. my closest in all that many rounds was probably three tiles away from a winning hand, and that happened a good three, if not more, times in the five or more rounds whilst trying to build up that thirteen odds bridge. so close, yet so far. evil? lucky? you tell me. frustrating and infuriating more like it, especially when the tiles that are discarded end up being picked up by the next player down to give winning combinations, with the vast spectrum of small to big winning hands. when money is at stake, one is not a happy camper when it comes to losing, particularly when it is a big win from a full hand. what should be done in such a situation? well, if the game is still ongoing, one tries to change the tiles. not much luck there, trust you me. so the final decision? one has to cut one’s losses by trying to minimize the loss by not throwing that money winning tile. sounds like a no brainer? unfortunately, hard work it is when the next player is a seasoned player who has an uncanny combination of luck and technique most times, alongside with the ability to calculate tile possibilities. reminds me of that mandarin idiom of using an egg to attack a rock. such an attempt can be, and is, only painfully futile. nevertheless, the itchy hands still desires to, someday, one day, make the impossibility of thirteen odds, a reality. till then, think there is better prospect in saving my wretched pennies in a piggybank than throwing good money away by trying to fulfill such a wish. dying aspiration it must be, for now that is, till the day the winds blow a stoke of luck my way.